there is a full charge for no show or cancellation later than 2 weeks before arrival day. we ask groups to choose a leader, who will organize the check in and the payment and to who we can refer in different circumstances. 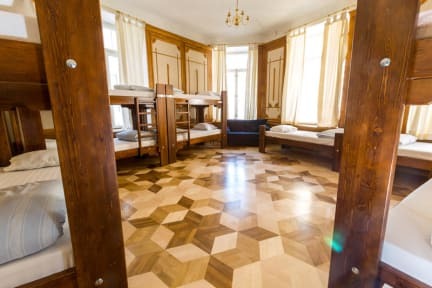 The Old Town Alur Hostel is one of the best located hostels in Tallinn, as it is just around the corner of the Town Hall Square but still in a quiet street. All of our rooms are clean, with comfy beds, free bed linen and all guests get a key for their room. Being the biggest hostel in Tallinn, we comfortably can accommodate both groups and single travellers. We provide you with organised daily tours, bike rental, but also we organise spontaneous movie nights, or we will take you out for pub crawls, parties and events that might just pop up in Tallinn. You surely won't miss a thing! We have a cosy common room where all our guests and staff can mingle up to have fun, relax, play games or watch a movie. Also you will find there our brand new computers that you can use for free. Our friendly, multi-lingual staff will do their very best to make your stay in Tallinn as pleasant as possible. They can also help you with advice on museums, shopping, international & local travel as well as ticket reservation, and Tallinn's vibrant nightlife. Made the biggest mistake of my life here, which I'm ashamed of and truly repentant for, but it doesn't reflect the quality of the hostel or staff. Some of whom are the most wonderful people I've ever met. Sorry for my stupidity and ignorant screw up, won't ever make that mistake again, not that I'll get the chance apparently. Excellent and welcoming hostel, awesome location, strong af beer, just don't be a terrible person and you'll have a great time. Touch card doesn't work, so don't try it. perfect for my needs, I especially like the way in which there is a quiet wing away from the "party hostel" types. I enjoyed my stay at Alur Hostel. The beds are comfortable. The staff were helpful & supportive. The location is superb. The kitchen is well equipped. I give it 5 stars in comparison to most hostels I’ve visited over the years since 1970. Well located, comfortable and with helpful & friendly staff! Amazing location and helpful staff. Big hostel but not that social for a solo traveler. the hostel is in an amazing location, couldn’t be better located! However the staff let it down a bit, not very informative or friendly. All the showers on our floor were broken when we were there, so we had to wait ages to use one. It’s was clean and good for one night but if you want to meet people this wasn’t the place. If you like a clean place, don’t come here. The living area and bar are nice and a good space to hang out. However, the rest of the place is questionably falling apart. The bathrooms were quite dirty the entire time, the shower I chose was clogged and started flooding out the door, and the door to the room was incredibly loud and squeaky. Every time someone opened it, everyone woke up. If you don’t mind a little grunge or perhaps if you’re in a big group I suppose this place would be perfect. Too noisy. Drunk people coming and going all day and night. Staff need to be around to tell them to be quiet, as they ignored all of us trying to sleep. Should have a big locker in bedroom designated to you at check-in. So it's insecure.